Toronto-born Binnie Brennan received her earliest musical training at age five. A graduate of Queen’s University’s School of Music, Binnie also pursued studies at the Vienna Musik Hochschule. Her teachers include Tibor Vaghy, Susan Lipchak, and Siegfried Fuehrlinger. Binnie is the author of three books of fiction, and is an enthusiastic chamber musician. 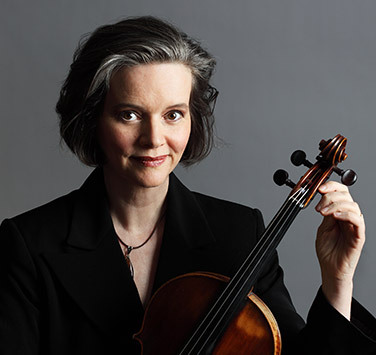 She has been a member of Symphony Nova Scotia since 1989. Visit Binnie’s website at binniebooks.com. I’ve been playing viola since I was 14 years old. I love the sound, and I love playing the inner voice. It’s a thrill to be in the middle of everything. I was born to it; I’m the youngest in a family of musicians. Gardening’s fun, and travel. I love to read, particularly Canadian fiction but also biographies. I write fiction also; and I enjoy watching movies. What kind of music do you enjoy (other than classical)? Usually it’s whatever I’m listening to. One of my favourites to play is Mozart’s “Jupiter” Symphony. My parents, my viola teachers, J.S. Bach, and Ella Fitzgerald. You can’t beat a great silent comedy, for example Buster Keaton’s two-reeler One Week, and his feature film Sherlock Jr. Not only are they wicked funny, but they’re groundbreaking works of art from a pioneering time, and they’re surprisingly modern. It’s a tie between Margaret Laurence’s The Diviners and Alistair MacLeod’s Island, the Collected Stories.